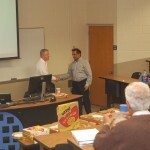 Students at the University of Toledo come away with a lot of knowledge and skills when they graduate. This premier University offers many challenging courses that prepare students for careers in their field of their choice as well as a number of extracurricular programs and groups to aid in students success. John Shepherd, President of AIN Plastics and a UT alum was recently asked to be a part of the educational opportunities provided through the APICS group. 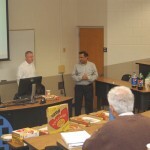 APICS is a group focused on learning the ins and outs of everything in Supply Chain Management. 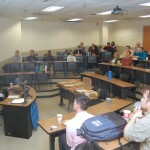 APICS has regular meetings in which students have workshops on things important to their future career in supply chain management. Things they might not see in the classroom, like how to build a resume, networking and what types of jobs are available for people in supply chain management now and in the future. 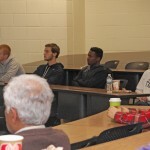 As part of this, John Shepherd, presented to students some real world experiences of how thyssenKrupp Materials NA utilizes supply chain management in their daily operations, planning and long-term goals. Students got to learn about the engineering plastics that the AIN Plastics Division supplies as well as a look what other thyssenkrupp divisions do. Mr. Shepherd also took a number of questions and enjoyed lively discussions with all attendees. All attendees were also invited to take part in a LinkedIn photo shoot provided by the AIN Plastics Marketing Department. Students were able to walk out with a professional photo to add to their LinkedIn profile, resume etc. As a company thyssenKrupp Materials NA values the knowledge and fresh ideas that students and recent graduates bring to business. To assist students further with their learning opportunities thyssenkrupp MAterials NA provides a robust Intership program as well as a Sales Talent Development Program. “Reaching out to students is a way to work with the future of business, and letting students know what opportunities are available is a win for everyone,” noted Mr. Shepherd. AIN Plastics has been actively involved in providing Internships, and they have two recent graduates of the Sales Talent Development Program. Becca Reidy and Louis Szilagyi are both full-time Inside Sales Representatives for AIN Plastics Dallas Branch after finishing their time with the Program earlier this year. AIN Plastics also take part in outreach including job fairs and events like the APICS meetings on a regular basis. As an alumni John Shepherd has taken part in a number of University of Toldeo events including Job Fairs and the APICS meetings. To learn more about thyssenKrupp Materials NA and the AIN Plastics Division stay tuned to this blog and visit us on social media. This entry was posted in Uncategorized on December 11, 2015 by ainadmin.